C100 and C200 For the Tough Parts requiring Accuracy yet 30-50% faster than any competitor. Traub allows 4 tools to be engaged at any given time, fastest tool change due to Turret design and largest amount of tools, Love and Fixed. Full intergration with Pic n Place Robot for part removal to trays and or inspection while next part is being machined. So how does a precision parts shop make a profitable go of it in the United States these days? “I had to figure out a way to win what was left of the work here in this country—the tough, complex parts that are too much of a challenge for most shops that may be accustomed to simpler work. If we wanted to stay in business we needed to be able to go after it successfully and profitably. Multispindle CNC’s let us complete a part with many small details and features in 10% of a single-spindle lathe cycle time. After some pretty intensive research, Jake decided on INDEX multispindles. “We took delivery of an INDEX MS22-8 8-spindle at the end of 2014, and, previously, INDEX 6-spindle multis. We now have 3 6-spindle INDEX MS40’s and will have a total of 3 8-spindle MS22-8 multis in calendar 2015. Jake has an unconventional view of the place of the multis in the range of metalcutting machine tools. Where do the shop hands come from? “We are unable to hire anyone that is ready walking in the door. So we have an informal mentoring program for new hires which can last as long as it takes,” Jake said. “Getting skilled people is still the hardest thing we do. Our educational establishment does not bring up the mechanically oriented person. So we prospect in the automotive repair area for new hires. About 9000 Swiss style machines have been sold since the 1980’s and most are still good machines, in Jake’s view. The process is one of the most reliable in the industry, and can be run for low hourly rates. In the turned parts market, the lowest price wins. “Part of my job is to know every machine tool out there and to figure out how it could help us. I am the Chief Technology Officer of the company,” Jake observed. “I am constantly looking for processes that that are much more competitive than anyone else. I don’t want to compete with the lowest rate. “For us, customers of a certain volume of parts per year are what are interesting to us--non-obvious work on a lathe that looks like it came off a machining center. 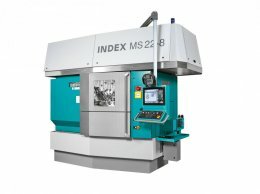 The INDEX MS22C-8, a modular eight-spindle machine opens up additional opportunities for already quick multi-spindle parts machining, especially highly complex parts for the automotive, defense, aerospace, mechanical, and medical industries. It also produces small batches efficiently and economically--bar-fed or loaded with chucked parts. 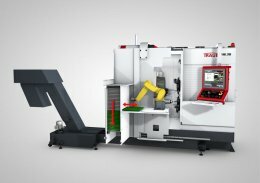 The main advantage to the MS22-8 is that it can be configured to operate as an eight-spindle machine, a double four-spindle machine, dropping two complete parts at a time or a machine with double rear end machining. When Jake finds a part that is in the range of 7/8 dia., because he can make it in 10% of the cycle time, he can win the work. Many times the work is so complex that Alpha Grainger uses a 3D printer for illustrating a part that 6 pages of prints are calling for in order to see how it has to be processed in order to quote it. This is more important as parts become more complex, like when it takes 63 tools to process, using double and triple gang tooling. The use of creative tooling to accomplish multiple operations in a single spindle is also a key advantage of the CNC multis. The MS22 hits a sweet spot for part less than 1” diameter and because of the 8-spindle capability, Alpha Grainger can win work Jake says he never thought it could. 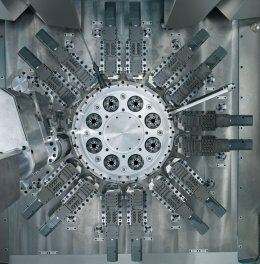 “The double pickoff spindle version is to me revolutionary because although all multispindles can accept a drill in each spindle, with the MS22-8 you have 2 cycle times to get the back work done, so you have a huge increase in spindle time available to do the work with 3 + 10 tools available. The pick-off work rarely takes more time than the main spindles do. The MS22C-8 can perform turning, off-center drilling and thread cutting, inclined and cross-drilling, milling, multi-edge turning, hobbing, tooth milling, deep-hole drilling or slotting. Another benefit for the user is that all standard tool holders and tool holder system interfaces can be used with a range of popular adapters (Capto, HSK, VDI, INDEX systems). Up to two swiveling synchronous spindles permit simultaneous rear end machining. 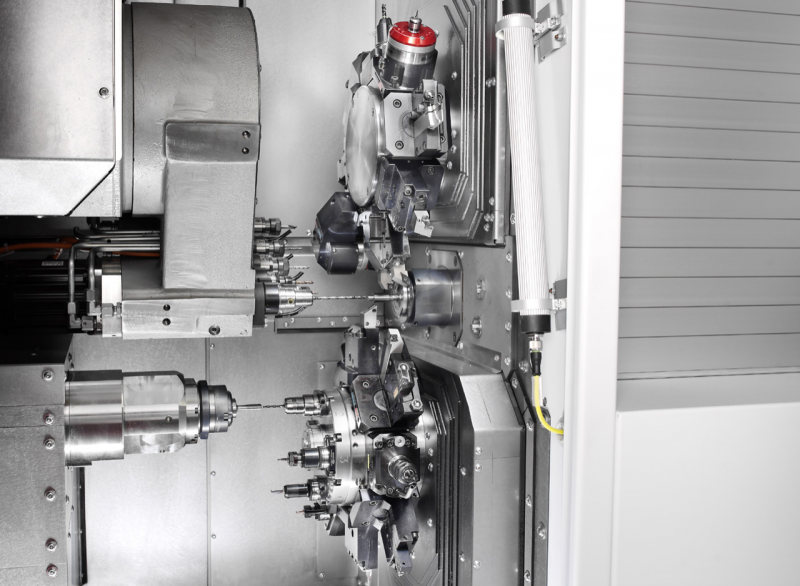 Combined with a total of up to 16 cross-slides, the eight-spindle machine is well-suited to even for highly complex machining. The speed of each of the eight liquid-cooled spindles can be controlled separately. The fluid-cooled spindle drum keeps the thermal growth in the spindle carrier to a minimum, resulting in higher power density in the spindle drum and the ability to recover the heat energy from the cooling fluid. The spindle bearing temperature can thus be kept at a low level, which also prolongs service life and improves thermal stability. The INDEX multis avoid thermal expansion with a 40kw chiller. The cross slides with integrated drives have a low-mass design with hydrostatic bearing support. Their low moment of inertia and resulting high dynamics facilitates outstanding acceleration in operation. 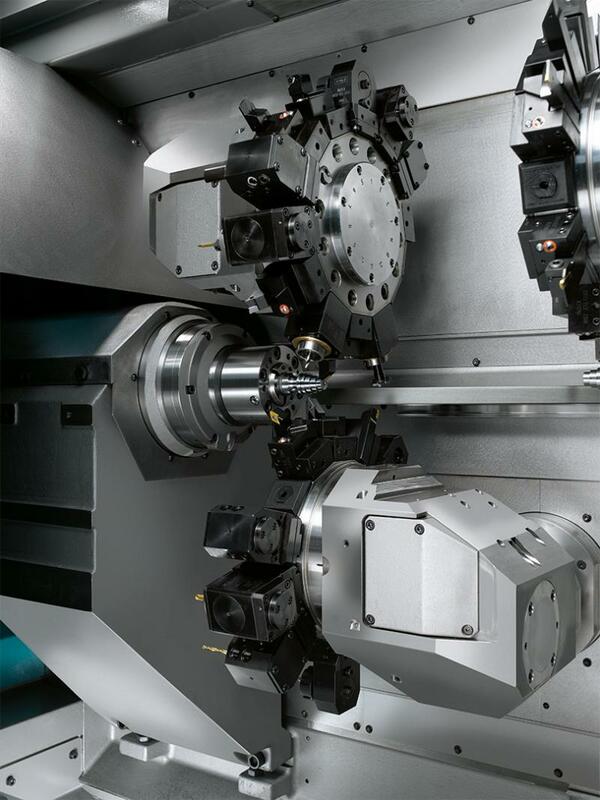 The MS22C-8 in double four-spindle mode actually runs as two machines working with one another simultaneously on a single base. Every second tool station always has simultaneous access to the same tools. When operated as an eight-spindle machine, the drum indexing angle from spindle to spindle is 45°; if the machine operates with two times four spindles, the drum indexing angle is 90°. The double four-spindle means two finished parts are produced by the machine per work cycle. In double rear end machining, there are six spindle positions available for front machining the workpiece and two spindle positions for rear end machining, and they all work simultaneously. With this approach, you can machine the rear end of a workpiece during two drum indexing cycles. At Alpha Grainger, Jake and his crew are making a lot of progress using the MS22-8 as a double-4 multispindle. To prove a process like that, Alpha Grainger can use its INDEX C200 automatic lathes. The advantage of hydrostatic sliding guide in the feed axis (Z) is the outstanding damping characteristic that prevents the transfer of the machining vibrations to the adjacent slide via the headstock. This helps to mitigate vibration and rattling while workpieces are being machined – even when the most diverse machining processes are being performed concurrently by the eight spindles. 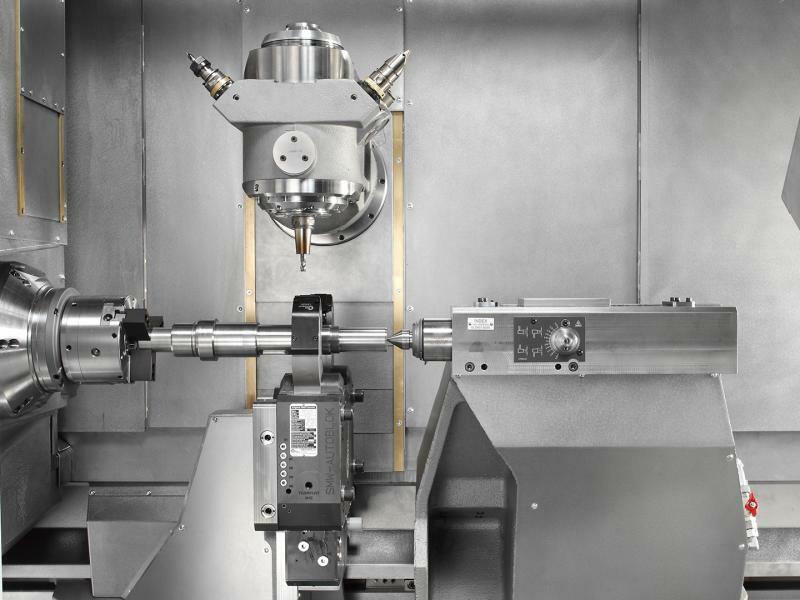 For example, one spindle can be used for heavy-duty roughing while high-precision finishing takes place on another spindle without sacrificing surface quality. In addition, the hydrostatic bearing is wear-free – there is neither friction nor a stick-slip effect. The advantage of the INDEX multi’s front-opening design for the operator is the excellent accessibility during setup and tooling. Moreover, there is the free chip flow down into the chip discharge chute. 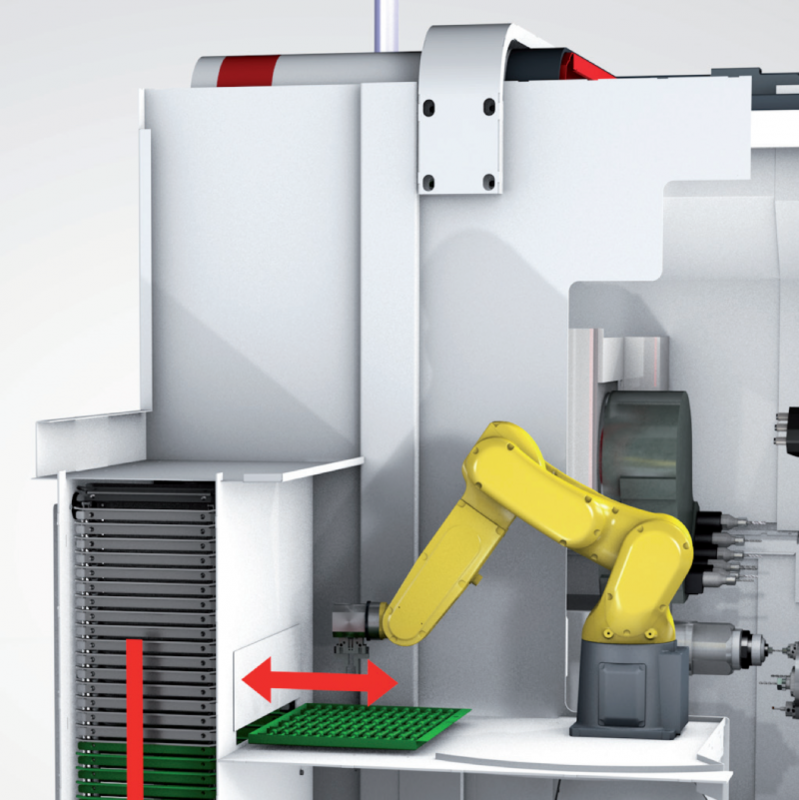 Discharging workpieces damage-free from the work area and placed on pallets in the right position for later treatment, the MS22C-8 can include optional handling solutions: machine-integrated handling with external stacking unit that ensures careful removal of parts from the machine, including measuring operations for the workpieces if needed. Workpiece data can be fed back directly to the machine control so it can automatically correct its machining parameters. Contact INDEX for details. C100 has 42mm bar capacity and the C200 handles 65mm bar. Both feature simultaneous machining using three turrets and two Y axes on main and counterspindles. Fast operators for a great price!.